luzinterruptus is an anonymous artistic group who carries out urban interventions in public spaces. the team use light as a raw material and dark as an artistic canvas. 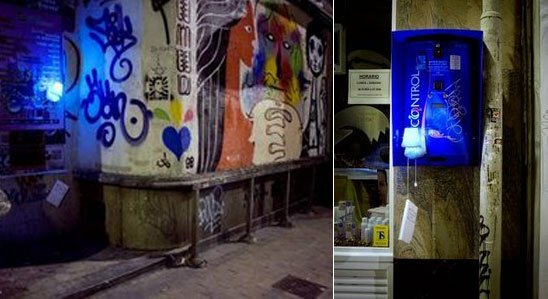 recently displayed on the streets of madrid was ‘personal reading in public sites’ a new lighting intervention created by spanish company luzinterruptus. installed across 12 sites across the city were traditional lamps from which crime and detective novels hung by strings. the objective of the project was to transform areas in the city into more comfortable places.